The warm waters of Malta are not instantly associated with dry suit diving, however as the air temperature cools Gozo makes a great place to learn how to get the most out of your dry suit. We offer this course from October through June as the air temperature is much more dry suit friendly. During the course your instructor will teach you the skills required to safely and comfortably dive in a dry suit. You will also learn how to look after your dry suit and how to deal with emergency situations that are unique to dry suit diving. 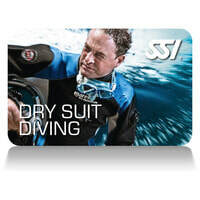 If you do not already have a dry suit contact us and we can help you choose the one that is right.